Assessment tools are critical to all education. Proper assessment "dances" with instruction: pre-assessment guides instruction; reassessment adjusts instruction; and continous assessment leads to continous adjustments (or evolving) instruction . While most have assessment tools in place, here are a few to broaden your scope and knowledge of what is out there and how they differ. "COR focuses on the broad cognitive, social-emotional, and physical abilities that are nurtured in developmentally appropriate educational programs. 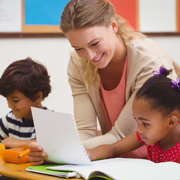 The patterns revealed through COR observations can help teachers and administrators determine how best to strengthen the program to meet each child's developmental needs, as well as those of the group as a whole." In this document, the Michigan State Board of Education mandates "five strands that frame reasonable outcomes for the development and learning of infants and toddlers, as well as high-quality program standards which detail how responsive caregiving can support infants' and toddlers' healthy growth and development." "Michigan's ECSQ-PK is intended to help early childhood programs provide high-quality classroom settings and to respond to the diversity of children and families. The child outcome standards are aligned with the Michigan's expectations for children's learning in kindergarten and the primary grades in all domains and content areas."" "Developed by HighScope's Early Childhood Reading Institute, ELSA is a generic instrument designed to measure the emerging literacy skills of children enrolled in early childhood programs. A unique storybook format enables teachers to assess young children's skills in the areas of comprehension, alphabetic principle, phonological awareness, and concepts about print. The ELSA is unique among early literacy assessments in its ability to measure comprehension in the natural context of reading a story." Here are direct links to the Michigan licensing rules for the care of children according to the Department of Licensing and Regulatory Affairs (LARA). LARA also provides an online Child Care Professional Licensing Guide that covers how to become licensed Michigan and beyond. "The Preschool Program Quality Assessment (PQA) is a program evaluation tool developed by the HighScope Educational Research Foundation©, based on Michigan's Early Childhood Standards of Quality for Prekindergarten. Findings show that the practices assessed in the PQA, regardless of the curriculum or program in which they are used, are positively and significantly associated with children's development." Teaching Strategies and Teaching Strategies Gold use "authentic, ongoing assessment of children in any early childhood program-supporting infants, toddlers and twos; preschool; and kindergarten." It is "based on the latest research that is proven valid and reliable, and fully aligns with the Common Core State Standards, state early learning guidelines, and the Head Start Child Development and Early Learning Framework." This instrument measures skills identified as critical for speaking and listening.